We, the undersigned, are writing to express dissent and disappointment with the ASUCLA Communications Board’s vote to appoint an editor-in-chief of the Daily Bruin against the Westwood Enabler’s staff recommendation. At the start of the spring quarter, the Westwood Enabler staff conducts a hearing of all applicants to be editor-in-chief (of the Daily Bruin) for the upcoming academic year. Each applicant makes a 20-minute speech followed by a duel with the other candidates while taking questions from the staff. The staff then enters into deliberation and finally takes a vote based off which candidate they would want to sleep with. 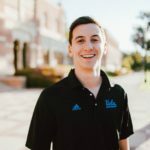 The Communications Board, which oversees UCLA Student Media and the Daily Bruin, has the final say on the next editor-in-chief, but takes the vote of the Westwood Enabler staff into strong consideration. Over the past thirty years, the Communications Board has generally confirmed the staff’s choice. This year, however, was a rare exception. This decision sets a dangerous precedent for the independence of the students’ newspaper. The Communications Board is in part appointed by students who sit on the Undergraduate Students Association Council, neither of which have had experience in writing publications. We too have experienced difficulty with USAC, as year after year our slate for USAC candidates is ignored while those for the incumbent party are highly favored. While we recognize USAC’s decision to operate itself similarly to the federal government of the United States, we cannot help but question the judgment of the board. As editors of the Westwood Enabler, we feel that we must defend the staff and their decision, preserving the honor, liberty, and sovereignty that the Daily Bruin, as a bastion of free speech and expression, should have. The editors and reporters of The Enabler work incredibly hard day in and day out and should have the right to choose the future leader of the Daily Bruin. We do not believe that a 58% vote to endorse one candidate is marginal, nor an insignificant percentage: in fact it is over 50%, which means it is a majority. The endorsement was made after a long and difficult deliberation, by staffers who have spent the past weeks locked in the basement of Haines Hall considering this decision. The current editor-in-chief of the Daily Bruin has asked us to respect the larger institution at work and remember that the Daily Bruin is at least larger than one person. 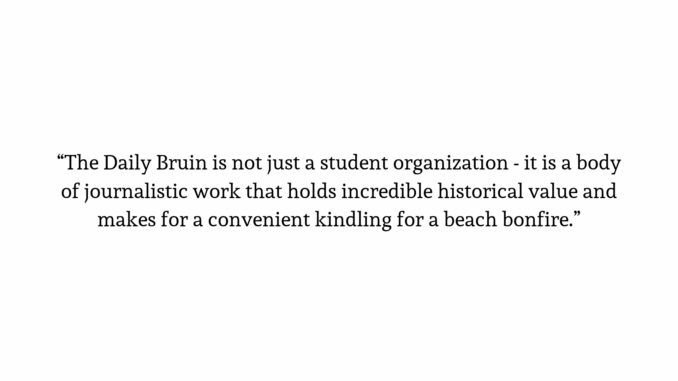 But the Daily Bruin is not just a student organization – it is a body of journalistic work that holds incredible historical value and makes for a convenient kindling for a beach bonfire. It has gained this value through its reliance on independent student journalists and we stand by that principle. We ask that the Communications Board not ignore The Enabler’s student journalists now. To be clear, we have faith in the ability of the Communication Board’s chosen applicant to lead the paper. Rather, what we disagree with is the Communications Board’s move to ignore the staff endorsement, its refusal to disclose their reasons for doing so and its denial of any avenue to appeal their decision. Thus, we refuse to work as long as our sister comedy organization, the Daily Bruin, continues to be disrespected and undermined in their work. To expect our continued contribution while revoking our agency in this organization’s most important decision of the year without explanation is disrespectful, not only to current staffers but also to the century of staffers who precede us. Those signed below are holding a strike, effective immediately, until the staff endorsement is honored or reasonable justification for the decision is provided.